Wash the spinach and remove the stems. Wash the potatoes thoroughly and boil until soft. Drain the water, let the potatoes cool briefly and then peel while still hot. Press the peeled potatoes through a potato ricer twice, then mix with egg yolks, flour, salt, and grated Parmesan cheese until smooth. Cut off a piece of the gnocchi dough and form an approx. 1-cm/0.5-in. thick log on a floured surface. Cut into small squares of approx. 1-cm/0.5-in. length. 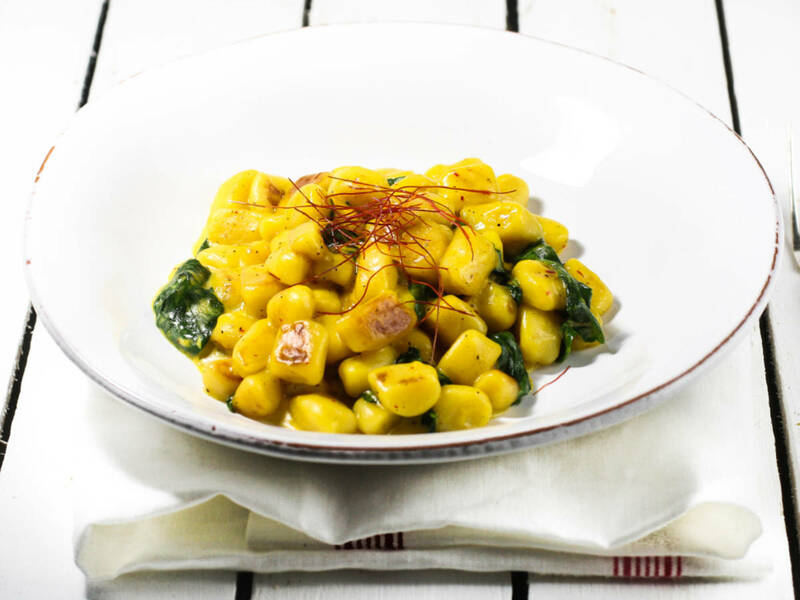 For classic-looking gnocchi, press each piece lightly with a fork. To give the sauce its vibrant color, crush the saffron and dissolve it in a small amount of warm water. Heat oil in a frying pan and fry the gnocchi until golden, then deglaze with the heavy cream. Add the spinach and bring to a boil. To retain its intense flavor, only add in the saffron liquid at the very end of the cooking time. Enjoy!